With a stay at Red Roof Inn Tinton Falls - Jersey Shore in Tinton Falls, you'll be within a 15-minute drive of Belmar Beach and Boardwalk and Dorbrook Park Recreation Area. This motel is 8.2 mi (13.2 km) from Asbury Park Boardwalk and 3.3 mi (5.3 km) from Monmouth Mall. Make yourself at home in one of the 96 air-conditioned rooms featuring kitchens with refrigerators and ovens. Your pillowtop bed comes with premium bedding, and all rooms are furnished with sofa beds. Complimentary wireless Internet access keeps you connected, and cable programming is available for your entertainment. Conveniences include desks and separate sitting areas, and housekeeping is provided daily. 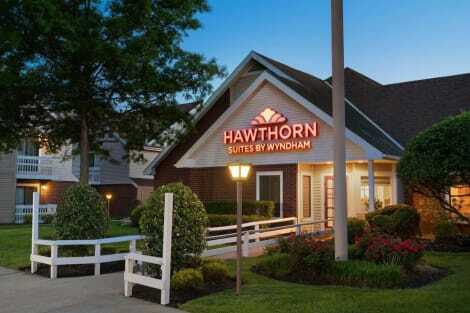 Located in Tinton Falls, DoubleTree by Hilton Hotel Tinton Falls - Eatontown is within a 10-minute drive of Monmouth Mall and Shark River Golf Course. This hotel is 8.4 mi (13.5 km) from Asbury Park Boardwalk and 9.8 mi (15.8 km) from Belmar Beach and Boardwalk. lastminute.com has a fantastic range of hotels in Tinton Falls, with everything from cheap hotels to luxurious five star accommodation available. We like to live up to our last minute name so remember you can book any one of our excellent Tinton Falls hotels up until midnight and stay the same night.